KIEV, Ukraine -- Ukrainian President Viktor Yanukovich’s administration is bracing itself for the return of Vladimir Putin as president. Vladimir Putin after his "honest" election. It’s hoping the powerful Russian leader won’t kick off a third term by flexing his political muscle against its increasingly isolated and vulnerable neighbor. Putin may not be as strong at home as he was in prior years. He faces the challenge of opposition forces seeking change and reforms. But even his domestic political foes are likely to back his main foreign policy agenda: asserting Moscow’s regional influence. 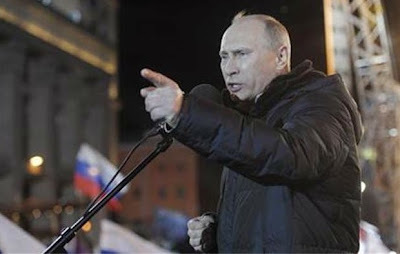 “We should get ready for Putin’s tough style, to the style of constant pressure,” Ukrainian political analyst Volodymyr Fesenko is quoted as saying in a report published in the English-language Kyiv Post. In recent years, Putin has made successful strides in luring Belarus and Central Asian countries towards closer economic relations through investment and economic assistance, as well as a CIS-free trade agreement and a joint customs union. The trade deals are seen as steps towards a broader Eurasian Union. Kiev has so far resisted, insisting its strategic aim remains European Union membership. But its fragile economy is stressed, in part due to increasingly high Russian natural gas import prices. Kiev is now paying about $416 per 1,000 cubic meters for gas imported, compared to an average of $235 in 2009. Yanukovich claims his country overpaid by some $3bn last year, when it’s annual gas bill stood at nearly $12.4bn. Since replacing the western-oriented Viktor Yushchenko in 2010, Yanukovich has repeatedly called upon Moscow to lower prices to a “European” price of about $250 per 1,000 cubic meters. That is Ukraine’s estimate of the west European price, minus transport costs and minus $100 discount, negotiated in 2010 in return for during which Ukraine agreed to prolong the Russian Black Sea Fleet’s stay in Sevastopol in return for a gas price reduction. But Russia has held firm, insisting that a sharp decrease on prices will only come if Kiev joins the customs union (incompatible with EU integration) and yields control over its strategic gas transit pipeline system. The latter pumps the lion’s share of Russian gas exports to Europe. If Yanukovich refuses to hand it over, Russia is threatening to bypass Ukraine by building the multi-billion-dollar South Stream gas pipeline stretching across the Black Sea bed to the Balkans. Russia has long desired to pull Ukraine back into its orbit of influence, but Kiev’s position is seen as particularly weak now. Yanukovich started his presidency two years ago on good terms with both Moscow and Brussels. But he has since irritated Moscow by resisting rapproachment, and Brussels by allegedly persecuting political opponents, notably former premier Yulia Tymoshenko. Tymoshenko is serving a jail sentence after being convicted of exceeding authority in brokering a 2009 gas agreement with Putin that Yanukovich claims introduced onerous prices. She denies wrong-doing and says she is the victim of a political attack. Officials in Kiev have yet to deliver on market-oriented energy reforms that Brussels has said are necessary for loans and financial support. The International Monetary fund has held up disbursements on a $15.6 bn loan programme, because of Ukraine’s failure to raise domestic gas prices. Kiev officials say they are working hard to swiftly unbundle state gas behemoth Naftogaz, boost market transparency and competition. But they are in the near-term desperate for some minimal support from Brussels in their tough negotiations with Moscow. They are also starting to complain that EU countries are unfairly joining Moscow – and going against Ukraine’s interests – by unilaterally supporting the South Stream project. Earlier this month, Ukrainian officials revealed that they had appealed to the director of European Energy Community to protest over Slovenia’s decision to unilaterally join other countries in the region supporting Russia’s South Stream, which Moscow’s critics see as a “political” rather than economic project. Both Kiev and Slovenia are members of the European Energy Community, a EU-backed cooperation agreement. Such unilateral decisions have frustrated Ukraine, which considers South Stream a threat to its and Europe’s interests by further strengthening Russia’s grip over the region’s energy supply. “When Ukraine joined the Energy Community, we expected that the EU will support us as a member and take into consideration our interest,” Volodymyr Makukha, Ukraine’s deputy energy minister told the Financial Times. But having irritated the EU so many times, Yanukovich is struggling to win friends in Brussels just when he may need them more than ever. Putin has often shown his annoyance with Kiev in general – and Yanukovich in particular. Once he is back in the Kremlin and again in direct charge of Russian foreign policy, he is more than likely to tighten the screws on Kiev. He knows that the EU has bigger problems on its plate than Ukraine and Washington is increasingly focused on its own presidential election. “Ukraine will face increasing pressure from the side of the Russian Federation,” predicted Ostap Semerak, a Ukrainian lawmaker allied with Tymoshenko. Safely back in the presidency, Putin has the upper hand and no reason to “rush” into striking deal with Ukraine, according to Ukrainian energy analyst Yuriy Korolchuk. After all, Kiev is already paying a lot for its gas. In a nutshell, time, money and power is on Putin’s side. Yanukovich has his work cut out.